By Thoriq Firdaus in Coding. Updated on November 15, 2018 . Today we are going to continue our discussion on Sass and this will be the final part of our Sass series. This time, rather than a theoretical approach, this is going to be a bit more practical. We will create an online vCard using Sass along with Compass. The idea is that the vCard should be easily adjustable, for color and size. In the process, we will be using a few Sass and Compass features like Variables, Mixins, Operations, Selectors Inheritance, Nested Rules and Compass Helpers. If you have missed our previous posts from this series, we suggest you have a look at them first before continuing. When working with Sass and Compass, planning is essential. We typically need to have the big picture on how our final result (e.g. page or website) is going to be. It will be helpful to browse some sites like Behance or Dribbble for ideas. 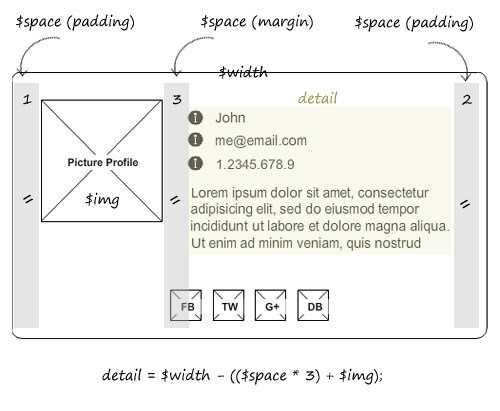 We can then draft the ideas onto paper or construct it in a wireframe, like this example below. As you can see from the image above, our vCard contains contact info about ‘John’ – a picture profile, some information about John, such as his name, email address, phone number and a brief description about who he is or what he does. That will be our ‘bio’ section. Below are his social identities in the form of social buttons. This will be our ‘social’ section. Before we start coding, here are some essentials to get ready. I gather that by now you should have Sass and Compass installed in your machine. We will also need a few assets like font icons and social media icons, which you can get from places like ModernPictograms. Lastly, since we are using Command Prompt/Terminal for this tutorial, we need to navigate to our directory and run Compass project with these two commands: compass init and compass watch. 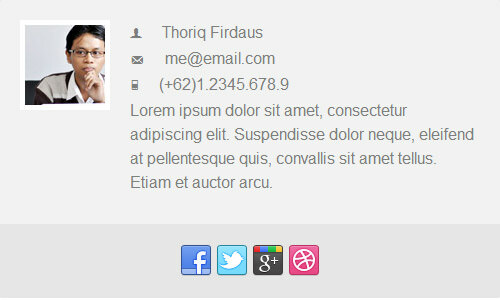 Below is the HTML markup of our vCard, it’s pretty straightforward. All sections are wrapped within logical HTML5 tag <section>. As you can see above, the social identities included in the ‘social’ section is structured within list elements so we can easily display them side-by side. Each of them is given a class name following this convention social-facebook, social-twitter, social-google and so on. If you cannot find config.rb file, you probably haven’t run this command compass init in your project directory. However, I prefer using Normalize that thankfully also comes in Sass/Scss format. Download the file here, save it in sass working directory and import it into our stylesheet. We certainly will have a few constant values in the stylesheet, thus we will store them in variables and these two variables below will define the base color of our vCard. While the $width variable below will be our page’s width; it will also be the basis for defining other element sizes. The extra Addition of (($space / 4) * 2) in the code above, is to calculate the total image width including the border that will frame the picture. A frame generally has two sides; top and bottom / left and right, that is why we multiply the division result by 2. There are apparently a few selectors in our stylesheet that will have same styling rules. To avoid repetition in our code, we will need to specify these styles in the first place and inherit them with the @extend directive whenever needed. This method, in Sass, is known as Selector Inheritance, a very useful feature that is missing in LESS. The following styles define the vCard wrapper. If you have been working with LESS previously, this code will be familiar to you and easy to digest. The wrapper’s width inherits the value from $width variable. The background color is darker by 5% from the base color, whilst the border color will be darker by 10%. This coloring is achieved using Sass color functions. 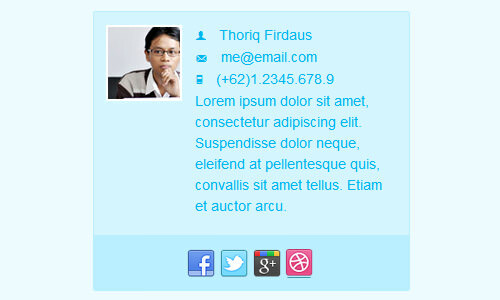 The vCard will also have 3px radius of rounded corners that is achieved using Compass CSS3 Mixins; border-radius(3px). As we have noted early in this tutorial, the vCard can be divided into two sections. 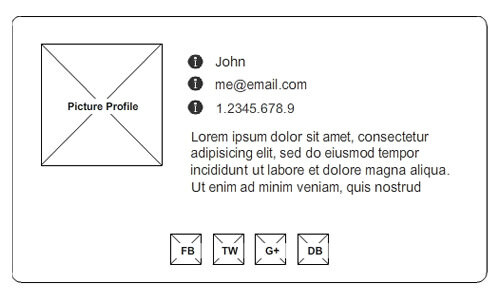 These nested styles below will define the first section that contains the picture profile with a few details (name, email and phone). There is one thing from the code above that we think you need to take a notice. The width in .detail selector is specified with this equation $width - (($space * 3) + $img);. This equation is used to dynamically calculate the detail’s width by subtracting the picture profile width and the spaces (padding and margin) from the vCard total width. The styles below are for the second section in the vCard. There is actually no difference with plain CSS here, only now they are nested, and a few values are defined with variables. In this section, we will display the social media icons using the image sprite technique, and Compass has a feature to do that job faster. First of all, we need to put our icons in a special folder – let’s name the folder /social/, for example. Back in the stylesheet, concatenate those icons with the following @import rule. The social/ above refer to the folder where we store the icons. This folder should be nested within the image folder. Now, if we take a look at in our image folder, we should see a sprite image generated with random characters, like social-sc805f18607.png. At this point, nothing still not happens at the front-end, until we apply the styles with the following line. In case we think that 500px is too wide later on, we only need to change the value in $width variable – for example, 350px – the rest will “magically” be adjusted. You can also experiment with the color variable. In this tutorial we have shown you how to build a simple online vCard with Sass and Compass; this is just an example, however. Sass and Compass are indeed powerful, but sometimes it is not necessary. For instance, when we are working on a website with a few pages and probably will also only need fewer lines of styles, using Sass and Compass is considered excessive. This post closes our Sass series and we hope you enjoyed it. If you have any question regarding to this subject don’t hesitate to add it in the comment box below.